Beautiful embroidery goes hand in hand with beautiful linen, and this is the perfect time of year to find antique linens at flea markets, estate sales, and yard sales. 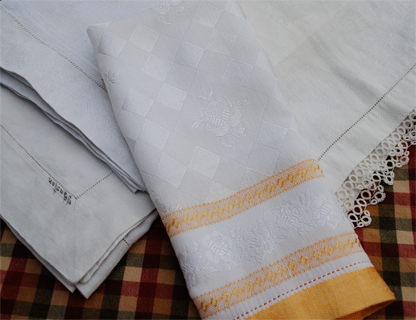 There’s nothing like the feel of antique linen. It could be that it’s pure nostalgia. More likely, it is because it is a fine-quality fabric that has withstood the test of time. Silky soft, but extremely strong as only natural fibers can be. The more you use linen, the better it feels. and one has cotton tatting. a family name written in one corner. Aging stains are common, even if linens were put away clean. With care, many can be eliminated. LeBlanc Linen Wash is another suggested soaking agent. Color-safe bleach or Oxy Clean are two other more easily accessible products. The white vinegar rinse rids the piece of soap residue and should always be followed by one or two clear water rinses. Nearly all recommend washing by hand, not wringing out excess water, and drying on a line. If machine washing, use the delicate cycle. Sun dry (nature’s bleach) by laying laundered linens on the grass or on a bush. This was a favorite practice during Victorian times and is practiced by modern-day collectors in moderation. 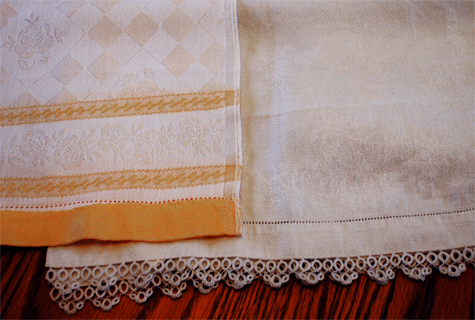 I'd love to see some of your favorite antique linens—Post them in the gallery!